Many users may feel not satisfied with the small screen of the laptop when watching a film or playing computer games. To get better experience, some will consider connecting computer to TV. So how do you connect them? Here are two ways to connect laptop to TV through cables, that is, via HDMI or VGA cable. Before you decide which way you should choose, you need to check what kinds of ports your laptop and TV have. And then buy proper cables. The left picture is HDMI port, and the right one is VGA. If your computer and TV both have HDMI port, you can buy a HDMI cable and apply method 1. Similarly, if you have VGA port on laptop and TV, buy a VGA cable and use the second method. Supposing that the port on your computer is different form TV, you can use a converter. 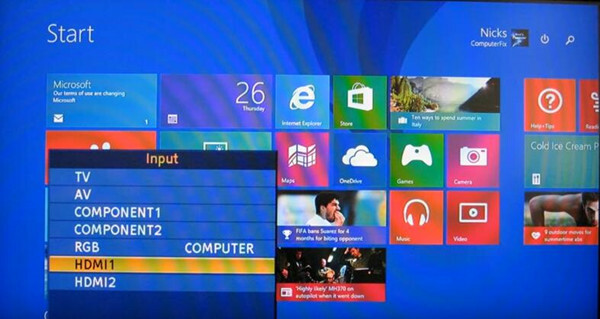 For example, if the computer just has a VGA port, but the TV just has a HDMI port, you can use a VGA to HDMI Converter. HDMI stands for High Definition Multimedia Interface. Connecting via HDMI is the best and easiest way to connect laptop to TV. Because you just need one cable to deal with video and sound, and the HDMI cables are cheap and can provide the better quality HD picture and sound. After you prepared an HDMI cable, follow the below steps to connect. 1. Turn on your laptop and TV. 2. Plug the cable into your computer and TV. 3. On the TV remote control, press INPUT button. Then the laptop should output its screen automatically to the TV, so your TV should display the same screen with your laptop. If it failed to do so, go to Settings > System > Display. Then adjust the resolution to match the TV resolution. And make sure TV is selected. Press Windows key and P key and choose Duplicate. 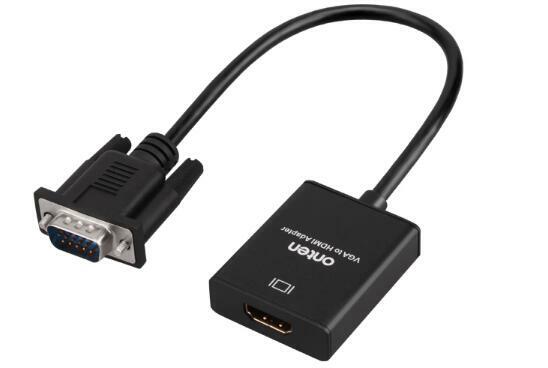 VGA is another way to connect laptop to TV through cables. But it just carries video signal but no audio signal. So you need to prepare a 3.5mm audio cable as well. 2. Plug the VGA cable into both your laptop and TV. 3. Plug one head of the audio cable into your computer and another head into TV. 4. Press INPUT button on the TV remote control. 5. You will see PC or RGB input in the list, choose it. If the TV screen is not synchronize with the laptop, on your laptop, try to go to Settings > System > Display. And adjust the resolution according to TV resolution. Make sure TV is selected. Then press Windows key and P key and select Duplicate. These two ways are similar in some steps, and you need to check which way you can use according to the ports of your laptop and TV. After you carried on these steps, your laptop screen should output to TV successfully.